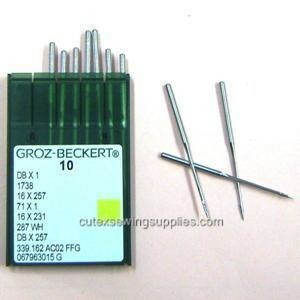 Set of 30 Brand New Groz-Beckert® Industrial Sewing Machine Needles. *A needle system is a group of needles made to fit specific sewing machines. All needles in a system are of the same length and shank size, but are of various diameters. Lower size numbers are narrower or thinner needles used for lighter materials. Higher size numbers indicate a needle of thicker diameter, used for heavier materials. Match your needle system to your machine, then the size of the needle to the product you are sewing. Sewing machine manufacturers use different needle style numbers for the same exact needles. You'll receive 3 packs of needles. Each pack contains 10 needles. Please e-mail us with Make/Model of your sewing machine if in doubt. 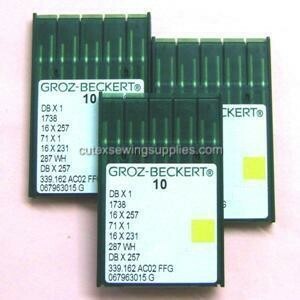 We stock many different types of sewing machine needles. Even if you don't find the one you looking for, it does not mean we don't have it in stock. Please let me know with needle system (style) number and/or machine make & model and we will find one for you.